The Kadamba Dynasty (345 - 525 CE) was a primeval majestic dynasty of Karnataka that ruled from Vaijayanti or Banavasi in present day Uttara Kannada district. The decline of the Satavahana power in the Deccan was followed by the rule of many lesser dynasties like the Chutus, the Abhiras and the Ikshvakus during the third century A.D. the Karnataka area, however emerged out of this political confusion in the following century, when the Kadambas of Banavasi rose to prominence. The dynasty later continued to rule as a feudatory of larger Kannada empires, the Chalukya and the Rashtrakuta empires for over five hundred years, during which time they branched into Goa, Hanagal, and Chandavar. 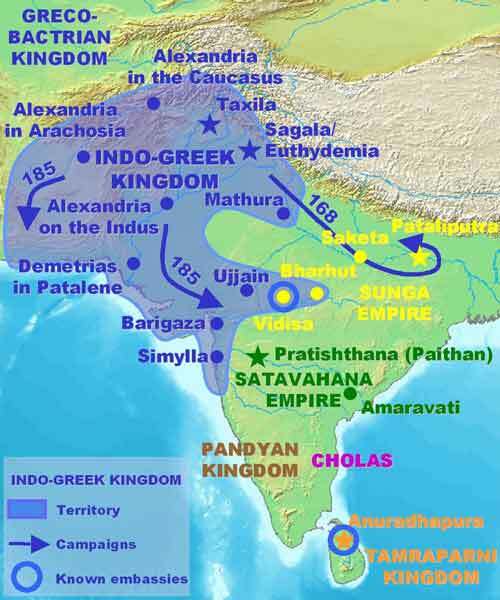 Mauryas, Satavahanas and Chutus were the pre Kadamba rulers where the ruling families were not natives of the region. Kadamba dynasty is important because it was the first indigenous dynasty to use Kannada at an administrative level. Kadambas kept paying nominal allegiance to other major power brokers of Deccan like Yadavas and Hoysalas of Dorasamudra and thus mantained their independence. Four different families of Kadambas ruled in southern India which was Kadamabas of Hangal, Kadambas of Goa, Kadambas of Belur and Kadambas of Banvasi. Kangavarma the successor of Mayurasharma was defeated by Vakataka Prithvisena who had to fight the Vakataka might to protect Kuntala. But he managed to maintain his freedom. His son Bhagiratha is said to have retrieved his father’s losses. His son Raghu who died fighting the Pallavas was succeeded by his brother Kakusthavarma who was the most ferocious and powerful ruler of the kingdom. He maintained marital relations with even the imperial Guptas of the north, according to the Talagunda inscription. One of his daughters was married to Kumara Gupta's son Skanda Gupta. His other daughter was married to a Vakataka king Narendrasena. He maintained similar relations with the Bhatari, the Alupas of South Canara and the Western Ganga Dynasty of Gangavadi according to the Talagunda inscription. The great poet Kalidasa had visited his court. The Birur plates of Kadamba Vishnuvarman call Shantivarman "The master of the entire Karnataka region". The Triparvatha branch that broke away in 455 ruled from Murod in Belgaum for some time and merged with the main Banavasi kingdom during rule of Harivarma. Finally the kingdom fell to the prowess of the Badami Chalukyas. 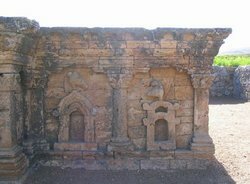 The Kadambas thereafter became feudatories of the Badami Chalukyas and later the Rashtrakutas and Kalyani Chalukyas. The successors of Mayurasharma took to the name "varma" to indicate their Kshatriya status. The recently discovered Gudnapur inscription states that Mauryasharma's grandfather and preceptor was Virasarma and his father Bandhushena developed the character of a Kshatriya. Recently a 5th century copper coin was discovered here with an inscription in the Kannada script which is considered as a one of the oldest coin ever discovered. The Directorate of Archaeology and Museums said that the coin's inscription in archaic Kannada proves beyond doubt that Banavasi had a mint in the 5th century. The coin's discovery supports those seeking classical status for the Kannada language. According to Talagunda inscription Mayurasharma was a Vaidika Brahmin scholar who belonged to an orthodox Brahmana family which derived its descent from Hariti and belonged to the Manavya Gotra. The family was deeply devoted to the Vedic studies and the performance of Vedic sacrifices. The Kadamba tree that grew near their house gave the family its name. He was the son of Bandhushena, grandson of his guru (teacher) Veerasharma and a student at the Agrahara (place of learning) in Talagunda(in modern Shimoga district). The Gudnapur inscription further confirms Mayurasharma's parentage and that he acquired the character of a Kshatriya. He was the founder of the Kadamba Kingdom of Banavasi. It was the earliest native kingdom to rule over state Karnataka. Raghu’s younger brother, Kakustha Varma succeeded him. He had functioned as a Yuvaraja, came to the throne. Dr. G. M. Moraes thinks that under him the "Kadamba Empire reached the acme of its greatness". The Talagunda inscription hails him as "the ornament of the Kadamba Family". He is described as a "formidable warrior" who defied every danger. His political influence is reflected in the fact that he was able to conclude matrimonial alliances with many prominent ruling families of the day. The Talagunda inscription states that he maintained such relationship with the imperial Guptas. It is possible that Kakusthavarma's daughter was married to Kumara Gupta's son, Skanda Gupta. His daughter Ajjhitabhattarika was married to the Vakataka ruler, Narendrasena. Similar alliances were concluded with the Bhatari chief, the Alupas and the Gangas. It extended the Kadamba influence among a number of ruling powers. The Halsi plates and the Hamidi inscription refer to the abilities, industry and magnanimity of Kakusthavarma, and tributes to his greatness. Santivarma was associated with his father's administration, had a brief reign. Chattadeva was the founder of Kadambas of Hangal. He was a feudatory of the western Chalukyas. 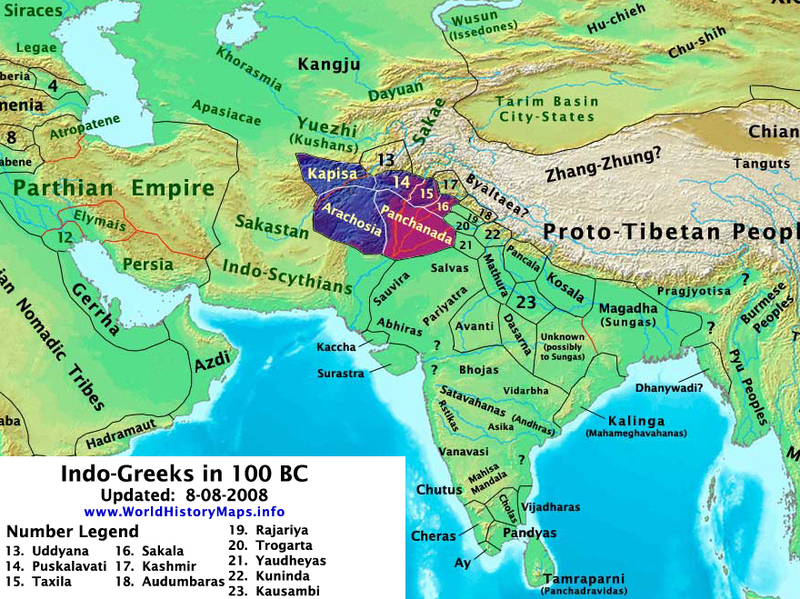 The Western Chalukyas (in 973) rose to power by defeating the Rashtrakutas with the help of Kadambas. Then Kadambas chief Chatta Deva was allowed by Taila II to rule Banavasi, he (during 980 - 1031 AD), consolidated his domain in the western Tungabhadra river basin under Chalukya shelter. Hangal attained significance under the Kalyani Chalukyas who were the chief powers in the Deccan (10th - 12th century), and was later comes under the Hoysalas with the decline of the Chalukyas. Bileshwara temple at hangal is in the Hoysala style. Brother of Mayurvarma. He helped to rule by his mother Akkadevi. He fought against the Cholas. During Toyimadeva's (Taila) reign, the capital was moved from Banavasi to Hangal. He issued first die struck gold coins. These coins are similar in weight and size to Kadambas of Goa. Compared to Goa Kadambas, coins of Kadambas of Hangal are relatively scarce and never been studied in greater details. Son. After the death of Kirtivarma of Banavasi, Taila II remerged both the kingdoms of Hangal and Banavasi. He formed a alliance with Pandya's of Uchchangi through marital knot, which further empowered him to sustain his power against Hoysala's troubles atleast for some time. But later, Vishnuvardhana Hoysala battled with him and captured both Banavasi and Hangal. He assisted the Pandyas against Hossala, Pandyas lost and the Hoysala (Vishnuvardhana) ire fell on Kadambas. They captured Banavasi and late Hangal. Taila-II was put to death by Vishnuvardhana and Pandyas of Uchchangi ceased to exist anymore. Son. There was a battle between Kalachuri and Hoysalas which was strong enough to deteriorate their powers, and Kamadeva was a opportunist to ascend the throne independently. Later, during Chalukya's restoration, he acknowledged the suzerainty to Chalukyas. But the subsequent fall of Chalukyas by the Yadavas made him to change over the acknowledgement of suzerainty to Yadavas. In 1310, the crushing defeat of Yadavas in the hand of Ala-al-din Mohammad Khilji, the Yadavas ceased to exist and so the Kadambas of Hangal. Kadamba family was still in picture by ruling ruins of the kingdom, as witnessed by the inscriptions which mentions the ruler Purandara of Hangal Kadamba family.